Why IHS should be updated ? Read more..
Seguin Group is committed to continuously improving its appliances; this is why research on the IHS system is in constant development, for your interest and for the interest of the environment. On our digital download platform, we will make available new updates on the firmware of the remote control or of the airbox, including new more efficient algorithms. Updating all the functions of your IHS system ensures an even better combustion. And because a demonstration is better than a long speech, in the download package we’ve included the IHS-Insight software. You will be able to connect the system Autopilot IHS to your Windows PC, and read the data about the combustion of your appliance, in real time (ambient temperature, flue gas temperature and oxygen level in the combustion chamber). Be notified about the new software updates, Seguin news and our partners offers. The IHS technology (Intelligent Heat System) allows the automatic regulation of your appliance with a remote control. 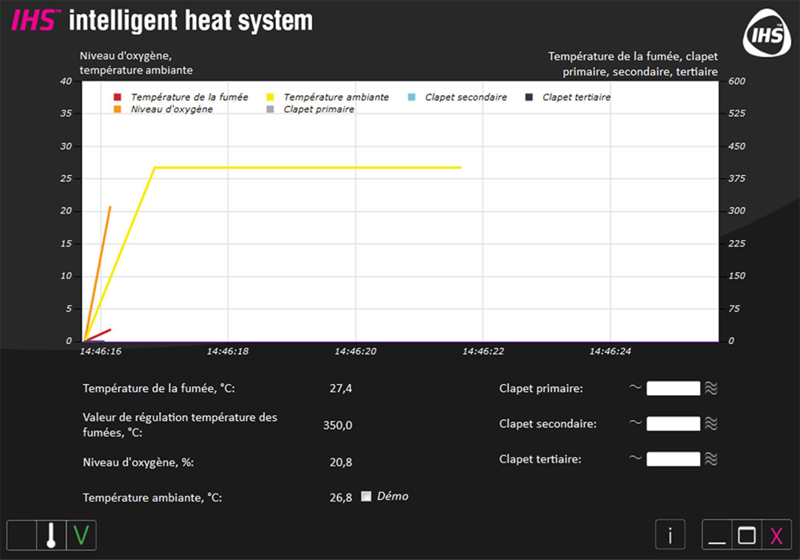 Using the IHS Insight software allows you to analyze the performance of your appliance equipped with IHS.